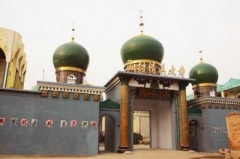 MengCun lies in Hebei province and was originally belonging to Cang county, but in 1955, MengCun and its vincinity became an autonomous Hui county. The Hui (回) minority people are famous in China for having had a great influence in the development of specific martial art styles like ChaQuan, XingYi/XinYi LiuHe Quan, Pigua Zhang and of course BajiQuan. The population of MengCun is about 10 000 people, about 50% of them belonging to the Hui minority. Originally a 100% rural area, MengCun has seen the development of a small local industry since the 70s. MengCun is famous for its local agricultural products such as cattle (MengCun beef), crop (radish, cereals, etc.) and fruits (jujube, pear, etc.). Local specific food includes the MengCun pizza and the MengCun beef hot pot. The main challenge for foreigners stopping in MengCun is the famous "Lao CangZhou" and other strong white liquor which are served in all restaurants when welcoming guests (both Hui and non Hui people in MengCun are hard alcohol drinkers, so get ready ...). The MenCun city centre comprises a few restaurants, some local shops, two banks with cash dispensers accepting major credit cards (Visa, Mastercard, etc. ), a hotel, some administrative buildings, a local hospital, a muslim steam bath and massage center and a big mosquee. The atmosphere in MengCun is rather quiet, far away from chinese big cities agitation. Different religions are practiced in a quite moderated way and there are no tensions between the different ethnic groups.